"The goal of this is to make difficult surgeries easier, or impossible surgeries possible," says robotics engineer Alex Greer, who demonstrated the controls to the gathered media. The NeuroArm was media-launched by University of Calgary researchers who'd once launched the space shuttle's robotic CanadArm. NeuroArm is a robot computer assisted surgery (CAS) system enabling remote neurosurgery. Exciting; the link is a few days old now and I wrote about teleneurosurgery a while back, but it's getting closer to what will be more exciting: clinical trials this summer. Since the images might contain theoretically 4096 different shades of grey it is obvious that smart phone displays can not handle that. But even the human eye cannot accurately distinguish between that amounts of different shades of grey. Therefore to allow the observer to interpret the image, only a limited number of greyscales are displayed at once. Clinically useful grey scale is achieved by viewing suitable range of grey scales depending on the tissue being studied. 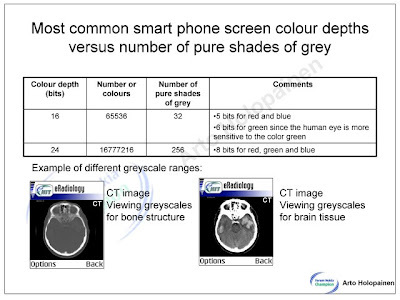 Though it wouldn't assist in a NeuroArm surgery, images may be sent to cell phones and discussed live. See i hate biology. But i found ur blog while searching something and it sounded interesting. So i dont want to comment much. No doubt it is an awesome blog.